Clandestine Village, or simply Clandestine, is an ancient Clannar? village that dates back to the late Feudal Era. 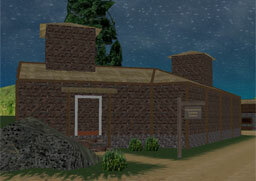 Due to the cataclysm that befell Grimmwood Forest, and the subsequent conquering of the Kingdom of Clannar by Alexander Comitus, the village became isolated and untouched by time and the modern progress that has overtaken nearly all of the other ancient sites of that Era on SW Island. To this day the village is inhabited by the human descendants of the Clannar kingdom, continuing on their culture's medieval ways and lifestyle. 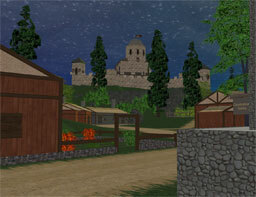 Clandestine Village is surrounded on all sides by the foothills and slopes of the Clandestinian Valley. On its south side is the freshwater Clannar Pond, from where the village receives a majority of its food and water supply, and to the north of the settlement is the ancient Fort Jemarr?, from where the villages' elders rule and pass their judgements. The village boasts a smithy, church, farms and even a subway station, which was installed after the Scarabian Historical Society? deemed the location fit to be a tourist destination. Clandestine Village was founded by Jemarr V, the second-last King of Clannar, in 1473 CE, and used the picturesque settlement's fort as his summer palace during the last years of his reign. When his son and successor, Jemarr VI, unwittingly caused his own demise by setting off a formidable Heretika curse in Grimmwood Forest, Clandestine became isolated from the rest of the kingdom and was forgotten about for many years. Times moved on, and the Scarabian Empire reigned over the remnants of the Feudal Era nations, but Clandestine continued to exist, self-sufficient and ignorant to the goings-on of the outside world. The village was ruled by a series of Lords which had taken up residence in Fort Jemarr, but in 1723 this practice was disbanded when the entire ruling line was killed in a tragic cart accident. Instead, four village elders were appointed, and this system has worked up until the present day. Life in Clandestine was unchanged until 2002, when the Historical Society visited the village and started up a series of tours. A subway station was installed, and the villagers watched as the outside world began to pour in. The village's fate is now uncertain as some of its younger residents wish to move on with the times, while the elders and the older residents want things to be just as they were for the past 500 years.